Welcome to Day Two of my Featured Scrapbooker, my daughter Ashley. Here are some more beautiful pages she created while home on Christmas break. The first page tells the story of her then boyfriend meeting her father's grandparents for the first time. She used ribbon and paper flowers for embellishments, and hand-wrote her journeling. The second page are pictures of her yard and house in the fall, and the third page are pictures of the area in which she lives in the fall. Don't you just love the button and twine treatment at the top of the page? The fourth and fifth pages are of a family boating trip with friends of ours and Ashley's then boyfriend. I love how she did the title in the first page, but my favorite is the 'Flying' page. I think its so creative how she incorporated the 'flying' theme with the 'Titanic' picture and the seagull. Have a Happy New Year. I won't be posting tomorrow because I'm throwing a large New Year's Day Party for friends and neighbors. Hopefully people won't cancel on me because of the weather. Its suppose to snow, again! Ugh! We've gotten more snow in the month of December than we did all of last year! Oh well, maybe people are used to driving in it by now and it won't bother them. We'll see. Today and tomorrow I will feature another crafter's work, my daughter Ashley. Ashley is a college student, and whenever she comes home on breaks she scrapbooks. Of course she always uses all my best papers and products that I've been saving for 'that special project', but we won't talk about that! LOL! Her dad says she developed her love of scrapbooking from her mother, and even though I've taught her a lot, I think she is a much better scrapbooker than me because she is a bit more artistic. The first page is the story of Ashley's engagement to Jason. She took a beautiful piece of designer paper that already had flowers and birds on it, and applied acrylic paints to make it even more special. The letters are all Cuttlebug dies. The second page are pictures of the area where we live. The leaves are from Walmart (only $1.00 for a huge bag!) and have glitter on them. The third page is more engagement photos and the story of how when Wheaton Students become engaged, they go 'Up the Tower' and ring the bell. The tower is part of the oldest building on campus. Its such a neat tradition. The tower picture was actually a picture in the Student newspaper that has Ashley's and Jason's names on it. Ashley photographed the newspaper article then aged it on the computer. Leaves, buttons, jewels, were added for embellishment. The fourth page are pictures of the Jason and Barney family at Thanksgiving. The Turkey is a Sizzix Die. The final page is of our family at Buena Vista Park in Alma the day after Thanksgiving. I absolutely love how Ashley did the title. She took the Cuttlebug Embossing Folder and highlighted it with chalk for the background behind the letters. She also added a lot of texture to the page with twine and another Embossing Folder. Come back tomorrow for a few more pictures of Ashley's Scrapbook pages. For the Limited Supplies Challenge on Splitcoaststampers this week, we were to make a card that had nothing to do with Christmas: no holiday stamps, no holiday sentiments, and no red and green. Well, I almost did it. After I submitted my card, I realized there was green on it. Oops. I didn't mean to, but I think my mind was thinking 'No Christmas Green', not 'No Citrus Green'. Of all the challenges on Splitcoaststampers, I think the Limited Supplies Challenge is always the hardest one for me, because I don't create well with limitations. Most creative people don't. As a result, I don't do this challenge too often, and when I do, I almost always make a mistake. LOL! I also submitted this card for the Holiday Challenge Extravaganza week going on at Splitcoaststampers. For this challenge, we were to make a card that from a life's memory. My memory was of when I was a little girl and my friends and I decided to make a lemonade stand so we could make lots and lots of money. Oh, we were so excited to begin our business adventure and thought we'd get lots of business and were filled with such high hopes. However, our hopes were quickly dashed when we sat in the hot sun all day without a single customer, for we set our little stand up right in front of my house, on a residential street, where there weren't any people walking around. But then, to our excitement, a businessman showed up and bought a glass of lemonade. I'll never forget how nervous I was taking his money and pouring his drink. Would it taste good? Was it sweet enough? Would he even like it? What if he didn't, would he want his money back? Then, to my surprise, he drank the whole glass down without even stopping for air, then, said 'Thank you' with a smile on his face, and walked away. I'm sure that lemonade probably tasted terrible after it sat in the hot sun all day, and I'm really sure that man probably didn't want that lemonade at all, but he sure brightened this little girl's day! I used the retired Stampin Up! set 'Simply Summer' for the main image and sentiment. The sentiment is cut with the Cuttlebug Circle Dies and mounted up on dimensionals. I colored the image with Copic Markers. The background is just one sheet of Designer Paper from DCVW's 'The Sweet Stack'. Ribbon was added for embellishment. I'm falling farther and farther behind on Patter Cross' Scripture Challenges, but I don't want to give them up, because they really help me grow in the Word. This word, 'Assurance' will be three weeks old tomorrow! LOL! But I will be faithful, and play along, and hopefully I'll be finished before she begins her new challenges of the New Year. I picked the verse Hebrews 10:22 "Let us draw near to God with a sincere HEART in full assurance of faith'. 'Assurance' is a very difficult word to create a card with. LOL! So I focused on the word 'Heart' in the scripture and I really meditated on the love of God and how we can have that full ASSURANCE of salvation, and His daily guidance. So in essence, when thinking about the word Assurance, I actually ended up creating a valentine for God. Happy early Valentine's Day Jesus! I created the card by stamping the retired Stampin Up! 'French Script' in the background. I stamped it off first on a piece of scrap paper so it would appear lighter. I then stamped the heart from the retired Stampin Up! "Mon Ami' set in Craft White ink on red cardstock. I then stamped it again in red ink on white cardstock, and cut out the 'L' , tied a piece of white floss around the letter, then mounted in up with dimensionals. The hearts are cute embellies I picked up at my local scrapbooking store. They are adhesive and very 'gelly' to the touch. The ribbon was one of those dollar spools from Michaels. I made a couple of 'chick' cards for some challenges on Paper Craft Planet. s Challenge where we were to emboss on a flower. I embossed 'Swiss Dots' on the flowers of the chair. To make this card, I simply stamped the image three times. Once on plaid designer paper, and twice on Cardstock. I cut out the chair and adhered it to the cardstock. Then I cut out the flowers, colored them with copic markers, and ran them through the Cuttlebug, then adhered them to chair. Finally, I colored the girl and cut her out and adhered her to the chair. Whew! It was a lot of work, and not something I'd do too often! LOL! The cardstock colors are all Stampin Up! 'Bashful Blue', 'Certainly Celery', and 'Pink Passion'. The image is MFT. My second card was made for the Shine Challenge. We were to make a card that showed something meaningful to us this Holiday Season. Well, other than celebrating the Birth of Jesus, whats especially meaningful to me at Christmas is spending time with all my closest friends. Every year I throw a huge Christmas Party for my friends and neighbors. We don't have any family left to celebrate with, so celebrating with our friends is especially important to us. We have so much fun, and we all look so forward to it every year (and often talk about it for an entire year afterwards too!) LOL! I made the card using the retired Stampin Up! set 'Girlfriends'. The cardstock colors are Georgia Pacific White and Stampin Up! 'Pink Pirouette'. The rest of the papers are designer paper scraps. The sentiment is mounted up on dimensionals. The images were colored with copics and ribbon was added for embellishment. I just wanted to take some time today to wish everyone a Very Merry Christmas. Although I do plan on making a nice roast dinner for my family this evening, today is pretty much a normal day for us. We celebrated Christmas yesterday by going out to a delicious lunch at Famous Dave's Barbecue (courtesy of my husband's boss), then we went to see the movie 'Australia'. If you haven't seen it yet, please go! It is the best movie I have seen in years, and Hugh Jackman is absolutely wonderful in it, (and very nice on the eyes too I might add! LOL!). Then we did a little bit of shopping and went to the Christmas Eve Service at our church. We have another holiday party on the 27th that were attending, and then I will be throwing a huge New Years Day party. So we sort of celebrate Christmas throughout the season, and don't do much but relax on Christmas Day. I'm sure your Christmas Day is much more eventful than mine! Because I had a lot of time on my hands today, I was able to do some challenges. I combined yesterdays sketch challenge with today's Way To Use It challenge on Splitcoaststampers. We were suppose to use our alphabet stamps/stickers on our card with an image in place of one of the letters. Well, I thought, what's the point when I already have a stamp set that does just that! LOL! So, I pulled out my Stampin Up! 'Big on Christmas' stamp set, along with the 'Holiday Treasures' Designer Paper and created this card. Because I was so short of Christmas Cards this year, I joined Splitcoaststampers Christmas Card Challenge. I will be making Five Christmas Cards a month, all year long, and this is my first one. I hope you had a wonderful day celebrating the birth of Our Lord and Savior, Jesus Christ. Well I think all my friends and family have received their Christmas Cards this year, so its probably safe to post it for my viewers. I received a ton of compliments already from all my loved ones about this card. It was a very time consuming card to mass produce, but very well worth it. I wanted a card that would contain not just a family portrait, but my children's school photo's, and a newsletter/poem as well. I originally saw this Pocket Christmas Card idea on another blog but I'm not exactly sure which one it was. I think it was the Verve Blog, if anyone else recognizes it, let me know so I can give the original artist credit. I actually took two of the pocket cards ideas and combined them into one card, and changed the papers/stamps to make the card my own. The card is a 'Pocket Card'. If you have never made a pocket card before, you can email me for instructions or visit Splitcoaststampers.com. I used Stampin Up! Riding Hood Red Designer paper and the retired 'Let It Snow' stamp set for the front of the card. The 'snow' is simply ripped white cardstock. The sentiment tag is Cuttlebug Tiny Tags. I hand-cut the two tags and embossed with 'Swiss Dots' and the 'With Love' Sentiment. I put a Christmas Poem on one tag, but you could easily put a brief newsletter on the tag too, and a family picture on the other tag. I adhered both tags together with an eyelet and ribbon. I made a cute little 6 x 6 Holiday Snowman Album to sell at Craft Shows/Consignment Shops. I pre-made all the pages; all the buyer has to do is put her own photographs inside. Each page has snowflakes or snowmen on them. The cover was made by embossing the top half of white cardstock with the cuttlebug snowflake die. I then tore sheets of white cardstock to create snowdrifts for the bottom half. The sentiment is from the retired Stampin Up! set 'Frosty'. All the images are Sizzix Die Cuts. I added liquid applique and stickles for snow. I made 20 pages for the book, but will only show you a few of them. All the pages have a similiar look, all with a blue and white color scheme, but use different stamps. The pages in these four pictures use images from the retired Stampin Up! set 'Its Snow Time'. These pages use images from Stampin Up! 'Big on Christmas' and the retired set 'Happy Winter'. The large snowflake is the Cuttlebug Cut and Emboss 'Ice Crystal'. The images of the tiny snowman with the cane is retired Stampin Up! 'Happy Holidays', the children on the sled are from retired Stampin Up! 'Winter Play'. The Snowman in the frame is from retired Stampin Up! 'Very Merry', and the little child is from 'Winter Play'. The last snowman pictured is from the retired Stampin Up! set 'Holiday Woodcuts'. I bound the book with my Bind-It-All machine. Even though Christmas is almost here, I am still working on Christmas Cards for on-line challenges. I figure I could still mail them before the New Year, or save them for next year. 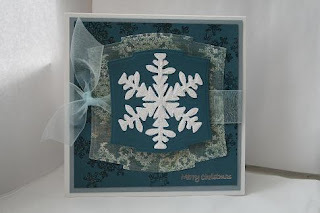 The snowflake card was made for the Limited Supplies Challenge on Splitcoaststampers. For this challenge we were to make a card that was mostly 3/4 blue and only use one embellishment, but all the glitter we want! Yippee! I love glitter. This card is so sparkly in real life! I used cardstock colors Bordering Blue, Not Quite Navy, and white, all by Stampin Up! The designer paper is from My Mind's Eye. I cut the shapes with Labels Two by Spellbinders. The main image panel is mounted up on dimensionals. I stamped the Not Quite Navy panel with versamark and then glittered it. The stamped snowflakes are from the retired Stampin Up! set 'Lace Snowflakes'. The Large snowflake is the Cuttlebug Cut and Emboss Die 'Ice Crystal' and it is covered in iridescent glitter. The sentiment is from 'Just Nutty' of Clear Dollar stamps and is embossed with silver embossing powder. A sheer blue ribbon was added for embellishment. The Snowman card was done for the Cuttlebug #5 Challenge on Paper Craft Planet. In this challenge we were to emboss on a transparency. I used the newest snowflake embossing folder to emboss snowflakes on a piece of acetate. I then put glitter glue on the back side of it. I stamped snowflakes on a piece of Stampin Up! Bashful Blue Cardstock. I then stamped and cut out the trees and snowman from the retired Stampin Up! set 'Its Snowtime'. The trees I adhered to the Bashful Blue panel, the snowman I put outside on top of the frame. I cut the frame by using my Nestabilities by Spellbinders. More snowflakes were cut with a cuttlebug die and adhered to the outside of the card. I then added more glitter on top of those. The sentiment is mounted up on dimensionals, its from the retired Stampin Up! set 'So Many Scallops'. I finished off the card by adding a piece of ribbon for embellishment and sponging the edges with Bashful Blue ink. I used a marker to color the inside of the frame to make it stand out more. Here are two winter cards I made using the same sketch and stamp set, but different colors and images. The stamp set is a retired Stampin Up! set. I don't own it, the images were sent to me via SCS Wish RAK, so I can't tell you the name. But if anyone else recognizes them, feel free to let me know! The Cardstock Colors in the first card are from Paper Craft Planet's Color Challenge #6. They are Stampin Up! Pink Pirouette, Green Galore, Garden Green, Riding Hood Red, Pixie Pink, and white. The Cardstock Colors in the second card are from Treehouse's Color Challenge on Paper Craft Planet. They are Stampin Up! Riding Hood Red, Pink Pirouette, Cameo Coral, Baja Breeze, Kraft, and White. Both Cards have die cut snowflakes and embossed snowflakes from Cuttlebug. Stickles, dew drops, and ribbon were added for embellishment. Welcome to the Fourteenth, and FINAL day of A Christmas Walk of My Home. Be sure to check Posts One through Thirteen to see all the interior rooms decorated for Christmas. Today I will feature the outside of the house. I don't do too much Christmas Decorating outside because I can't stand the cold and my husband won't do it for me! Oh well, I can't get him to do everything I want! LOL! As stated in my very first post of the Christmas Walk, the house was built sometime in the late 1800's by a man who also built a mill on the river below the house. The original portion of the house sits on a sandstone foundation and the house is made of brick. The porches you see are all new. When we first bought the house there wasn't a porch, but a ugly, sided, enclosed entryway attached to the garage which was right up against the house. It was awful, because it blocked all the light from entering the house and when you looked out the dining room windows, you saw a garage wall. Ugh! So we tore down the old garage and entryway and built a grand front porch and moved the garage back farther. The side porch you see in the first picture is the entry into the new addition. The house sits on almost two acres of land which are primarily perennial flower beds and grassy paths. I have a few scrapbook pages posted on my blog showing pictures of my garden if you are interested in seeing what the yard looks like in the summer. That is my garden shed located in the bottom right of the second picture. Here is a view of the back of the house. Those are steps and retaining walls covered with snow. You can see the sun room addition on the right. Although the interior portion of the sun room matches the original house very well, unfortunately the outside doesn't. Ideally, we would have loved to have the addition with the same brick to match the original house and also have the structure 'tie in' with it a bit more, but finances did not permit that. The good news is that the addition is on the back of the house, and can't even be seen by the road. Here is my side entry porch. I use mostly natural elements when decorating the outside. I simply cut pine boughs and berries from the many trees and bushes I have in my garden, and make an arrangement out of them. This is a close up of my outside Christmas wreath and my wagon display. The wagon is left outside all year and I change the decorations depending on the season. In the summer its filled with fresh annual flowers, and in the fall its filled with pumpkins, gourds, hay and a scarecrow. I bought this wagon at Kohl's for about $20.00. What a deal! Here's a little guy I picked up at Kirklands. He's actually a bird feeder. There's a place to put bird seed on the top of his hat. I nestled some fresh greens underneath him. Isn't he a cutie? This is my formal front porch. The leaded glass door is new. For Christmas Decorations I simply added fresh greens in all the planters and hung a 'Peace' sign. Well I hope you have enjoyed seeing my home decorated for Christmas. Although I will probably never post anything this detailed about my home again, I will always show you different seasonal displays and garden pictures throughout the year. I just heard the great news that Spellbinders is doing a nationwide search for a new design team and anyone can try out for it! I'm so excited! It would be a DREAM of mine to be a part of this fabulous company. I'm definitely going to try out for it, and YOU can too! Read all about it here: http://spellbinderspaperarts.com/blog/category/announcement/. If you put this announcement on your blog, you will also be eligible to win some fabulous blog candy! Wish me luck! And Good Luck to you too! I made this card for yesterdays sketch challenge on Splitcoaststampers and I used last week's colors from Paper Craft Planet's Color Challenge. The stamped images are from MFT's 'Punny Farm'. I cut out and mounted up the center cow on dimensionals. The cows are colored with copic markers. The small flower is a stamp from the retired Stampin Up! set 'Girlfriends'. I put an adhesive crystal in each flower center. The cardstock colors are white, Chocolate Chip, Lovely Lilac, Pacific Point and Gable Green, all from Stampin Up! Lilac ribbon was added for embellishment. Welcome to Day Thirteen of A Christmas Walk of My Own Home. Be sure to take a peek at Posts One through Twelve if you want to see any of the other rooms of the house. Today's Featured Room is my Sun room, and the last interior room of my home that I will show. There are still three more rooms to my house (exercise room, laundry/craft room, and the basement), but those are boring and are not decorated for Xmas, so I will not picture them. The first picture shows a view of the sun room as seen from the family room balcony. The second picture shows a view of the room as if you were standing on the staircase. My husband built me the sun room because I am an outdoorsy girl living in a cold climate. I love the warm summer temperatures and being outside with my flowers and 'little critters', so the long winter months are very hard for me. Having the sun room is like a tropical paradise under glass and really helps get me through the winter. All the plants you see are real, and the first question everyone asks when they see this room is 'How do you water all these plants and how long does it take?". The answer is: I use a ladder to get to the plants up high, and it only takes me about an hour a week to water. The sun room is the perfect environment for plants: cold at night, and indirect light; so they survive just fine with little, if any, maintenance. I have four birds: a finch, a parakeet, a cockatiel and a lovebird. They all have their own cages, but are let out daily to fly about the room. If you look carefully at the second picture, you can see Emery, my cockatiel sitting in his favorite spot in the sun room: on top of my Tiffany stained glass artwork looking out the window! LOL! He absolutely loves it up there! My birds are my little friends that keep me company all day while I stamp. They frequently fly over and sit on my shoulder, or they walk all over my stamping table to see what I'm doing. They are always very curious and love to 'peck' at whatever project I'm working on, so I have to be careful with what I leave laying around. And yes, they do poop. On me and mostly on the windowsills since that's where they spend the most time. So once a week when I have the ladder already out to water the plants, I just clean the windowsills down too. The entire room is built with a post/beam structure. You'd have to talk with my hubby about he did that one! There is not a cement floor. Its simple beams cemented into the ground. The floor is sand with hot water pipes inside to heat the room. The sun warms the stone and the pipes also warm the stone and the heat rises. On a cloudy, bitter cold winter day (single digit temperatures) it will only get to about 55 degrees in the room, on a normal, cloudy winter day its in the 60's, but on a sunny day, no matter what the outside temps, its in the upper 70's. This room is so large, and that my hubby did the heating this way to say money on heating costs. The floor of the sun room is all outside patio bricks purchased at Menards. The woodwork is all pine. There is a shelf that runs across the entire length of the sun room that displays plants and decorations. I have a 'Tuscan' theme going on in this room in case you couldn't already guess that by the wall treatment, colors and decorations. Also notice in the third photograph a close up of the staircase wall. The brick and lower stonework is the original exterior of the home; for the old portion of the original house is built on a sandstone foundation. The railings of the stair case are copper plumbing pipes. The stair treads are the same ceramic style featured in the entryway and family room. My actual craft room is a tiny walk in closet that also holds my washer/dryer and an extra refrigerator. Its located inside the door off to the right in the third photograph. I do larger projects out in the sun room on the large table you see pictured. Behind this table is where I am temporarily keeping my sewing machine until I can move into my new craft room (which is now the exercise room, but my hubby is going to move the exercise equipment into the basement, and then I can have that large room for my crafts). I really don't like my sewing machine and 'stuff' sitting out in this beautiful room, but it will have to do for now. Here is a picture of a small sitting area in the sun room that is used mostly during large parties. All this furniture is either hand-me-downs, or was purchased at a consignment shop. Someday I hope to replace it with better furniture. A tinsel tree is placed on the coffee table for Xmas. The dining hutch holds extra dinnerware for entertaining. Whenever we have people over, we usually eat down here because the upstairs dining room table only comfortably seats four. I put garland on the top of the hutch and inside for Xmas. If you look to the far right of the picture, you can see the inside of the exercise room. Its located right under the family room balcony. That will be my new craft room someday. Here is a close up of a large Xmas wreath. After Xmas it is replaced with a grapevine wreath. Here is a close up of the stair garland. I don't do too much Xmas decorating in this room because there is already so much natural greenery. I simply add garland to the staircase, a giant wreath on the wall, garland on the dining hutch, the green tinsel tree on the coffee table, a Xmas centerpiece on the dining table, and I put a simple wreath in each lower window of the sun room which is hung with a velvet red bow. Here is a close up of one of the wreaths in the windows. Each wreath has a red velvet bow, jeweled-tone bulbs, hibiscus flowers and a bird--all to match the room. You can see my 'winter garden' through the window pane. The sun room has a view of my gardens and the river. My final picture shows four of my other little friends, my pond fish. They actually live outside in an outdoor pond during the summer months, but in the winter the water freezes because the pond is not that deep, so I bring them inside. Its not the most beautiful indoor fountain in the world, but it makes a lovely sound and keeps my dear fish alive. So if any one's depressed this winter and your in the area, feel free to drop by and spend sometime in my sun room. You'll feel relaxed, refreshed, and renewed in no time!